There’s nothing like a summer barbecue with family and friends to celebrate the season! For a quick, easy, and healthy meal, add a green salad and fresh corn on the cob and you’re good to go. In a glass measuring cup, squeeze limes, yielding ¼ cup of juice. Add the garlic, pepper, olive oil, and cilantro and stir. 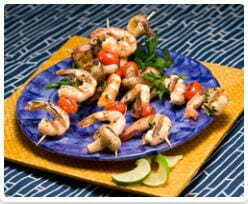 Place the shrimp in a medium bowl and pour the cilantro lime marinade over the shrimp. Let the shrimp marinate for 10 to 15 minutes in the refrigerator. Alternate cherry tomatoes, mushrooms, and shrimp on 4 skewers. Grill the skewers for 3 to 4 minutes on each side until the shrimp are just cooked through. Each serving contains 160 calories, 6 g fat, 85 mg cholesterol, 95 mg sodium, and 17 g carbohydrates.